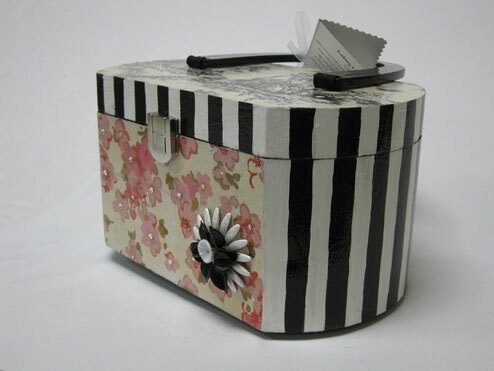 Black & White stripes blends well with our light pink flower print. We added tiny Swarovski crystals in the center of the flowers. The top of the bag has an old fashioned black and white print. The added flower has white petals and to give it a three dimensional effect we added vintage black glass leaves and a white center. What is more striking than zebra print. This "Vbox" handbag is amazing. We added a brass elephant and leaves and then filled in real coral, green turquoise and black and white handmade beads. 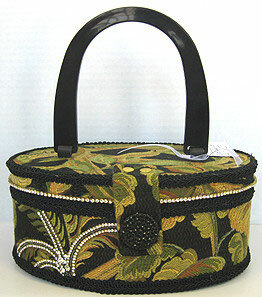 The green brush takes this bag over the top. 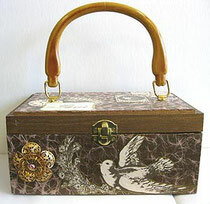 This "Vbox" floral print has soft off white and light browns. 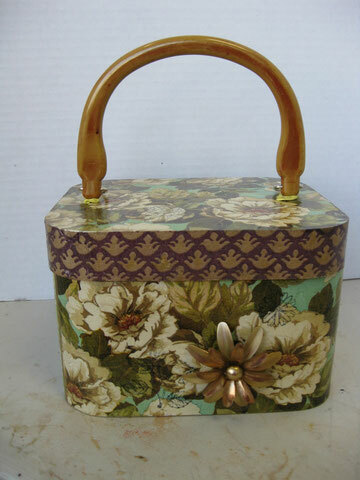 It is perfect with the brass three dimensional flower. The rim is offset with burgundy and tan. It is beatiful. 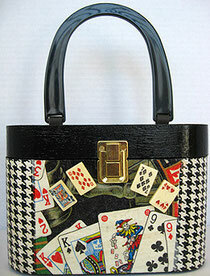 V101 – “I Love Lucy” – This bag is so very fifties, we had to name it after our favorite vintage TV show. The base of the bag is painted red. 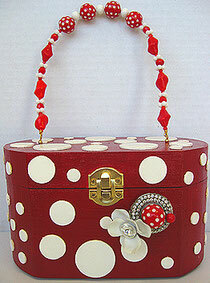 The white dots are added to the base bag, which gives it a very 3-dimensional effect. We love the true vintage accent. The handle is vintage beads. It measures 7 1/2" across, 4 1/2" height or top to bottom and 5 1/2" deep. 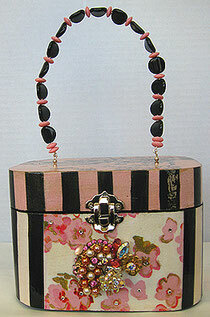 V103 – Roaring Twenties – This Black & Pink box is absolutely stunning. We decoupaged the center and hand painted the stripes. We added some Swarovski crystals on the center flowers. 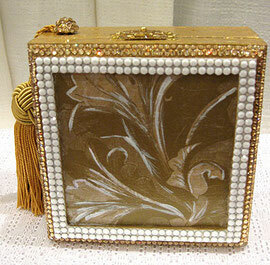 The vintage jewelry centerpiece is one of a kind and will vary with each bag. The handle is assembled with vintage black and pink beads. It measures 4 1/4" height or vertical, 4 1/4" horizontal or across and 5 1/2" deep. V105 - "Cat & Mouse"
V105 – “Cat & Mouse” – All the designs on this bag are hand painted. The cats are surrounded with Swarovski crystals. The vintage centerpiece and the vintage frosted stones help complete this piece. The handle can be switched out with chain for your shoulder. 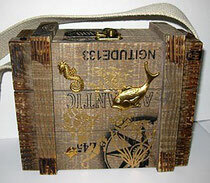 It measures 8" across or horizontal, 5 1/4" top to bottom or height and 7 3/4" deep. V104 - "Dots On A Box"
V104 – “Dots on a Box” – We placed individual wood dots on this box, which makes it very three-dimensional. We think this box will get tons of compliments. 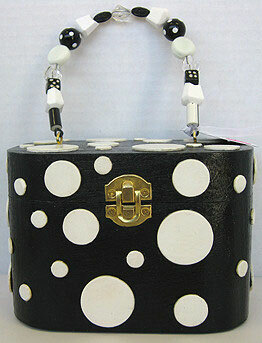 The vintage black and white bead handle completes this bag. It measures 7 1/2" across or horizontal, 4 1/4" height and 5 1/2" deep. 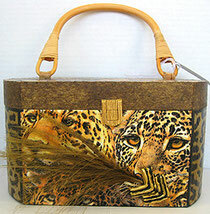 V107 - Leopards in A Bush"
V106 - "Art Deco It Is"
V109 – “Las Vegas” – This bag will take you on a winning streak. 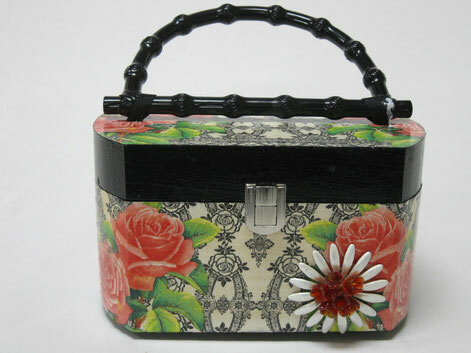 We decoupaged the base and hand painted the accents. 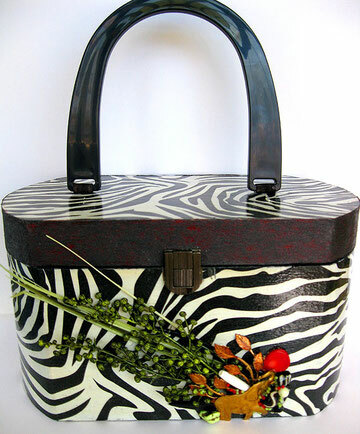 We used three-dimensional acrylic cards as an accent and they do make this bag pop. The black and white pattern on the side brings it all together. We love the black acrylic handle and painted the edge black. It measures 8" across or horizontal, 5 3/4" height or top to bottom and 7 3/4" deep. V110 - "Music & Flowers"
V118 - Paris - This bag has soft Pink images of paris on it. 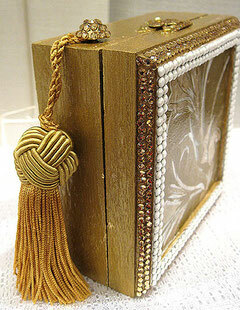 We used a vintage gold filigree findings as an accent. 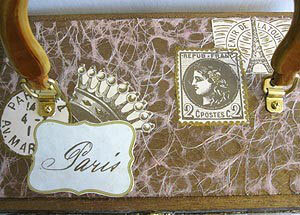 The Chocolate brown base of the bag is covered with a spider web soft pink fibers and will bring back memories of that special trip to Paris. 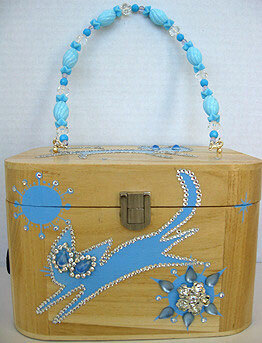 V117 - Nautical - This wood box has a rustic Water theme. It's great for your casual outings. We used canvas for the interior and hemp for the trim and strap. 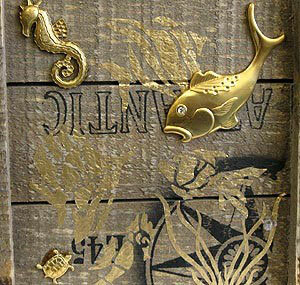 We kept the theme going by adding a brass fish, seahorse and a tiny turtle. 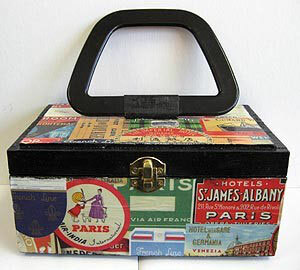 V119 - Bon Voyage - The images on this bag brings fond memories of all your travels. It's a collage of hotels, cities and landmarks. 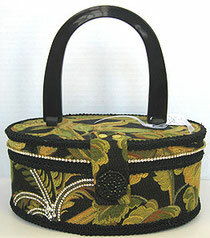 I think you will love the collage of colors because this one can be carried with any color choice. V120 - This small Vbox is perfect for a evening out. It's just big enough for your cell phone and lipstick. 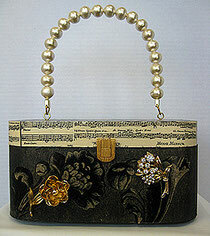 We decoupaged the center of this bag and hand painted the accents. We added Swarovski crystal in Chalkwhite to accent the front..then added Light Colorado Topaz crystal on the edge. We paved the crystal closure and added a deep rich golden tassel for the handle..qui qui! !